Traditional wedding shoes are very difficult to find right now. But nothing completes your look quite like a pair of traditional wedding shoes. They are hard to find - but the effort is well worth it. I recommend tracking down the shoe brands that carry a sizeable wedding range. Alan Pinkus (see photo) is one such designer and his shoes are available in most capital city Myer stores in Australia as well as online. The range includes a variety of colours and heel heights. 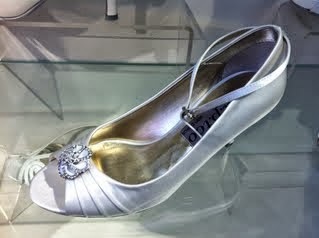 You can also get your wedding shoes custom made for around the $300 mark and up. A pair of proper wedding shoes can easily cost you from $180-$250 and up. So it isn't ridiculously expensive. You get to pick the heel height, style, colour, diamantes etc. But you don't get to try the shoe on before it gets made. You will be on your feet most of the day - photography shoots, talking to guest, and dancing. The wrong pair of shoes will leave you in pain and make all of this very difficult. If you aren't used to 6-inch heels - then your wedding day is not the day to start wearing them. Remember that you will be a little bit out of your comfort zone already with your wedding dress - hey it isn't every day that we wear a dress with a train is it! So don't add to your discomfort with shoes that make you feel like you are about to trip over. Are the shoes you are looking at suitable for dancing in? If not you can consider buying a second pair to change into like many brides do - but make the right decision now and you can save yourself that added cost. This choice is very popular with brides right now. They are choosing bright colours that will pop with a white dress like royal purple, electric blue, or bright red. Electric blue is by far the favourite choice as it sorts out the "something blue"! You can also feature your shoes in your photography shoot - it makes a cute photo to have the bride lifting up her dress enough to allow her bright shoes to show! But be careful - we've seen brides who have gotten it dreadfully wrong - black thick straps are more suited to work than under a wedding dress! If you are having a country wedding then a cute pair of boots may be the way to go. And they are quite practical too if you have to traipse through a farm yard! But if you are having a city wedding, your boots are best left at home! If you can order shoes from anywhere in the world - but remember that comfort is very important on your wedding day. You have to try a pair of shoes on to know if they are suitable for you. Especially as a lot of wedding shoes are made out of materials that don't stretch.